Texas isn’t widely known for its Art Deco design, but the Lone Star State has more than its share–particularly in north Texas, where cotton, cattle, and oil combined to create rich modernistic buildings, artwork, and monuments in the 1920’s, ’30s, and ’40s. 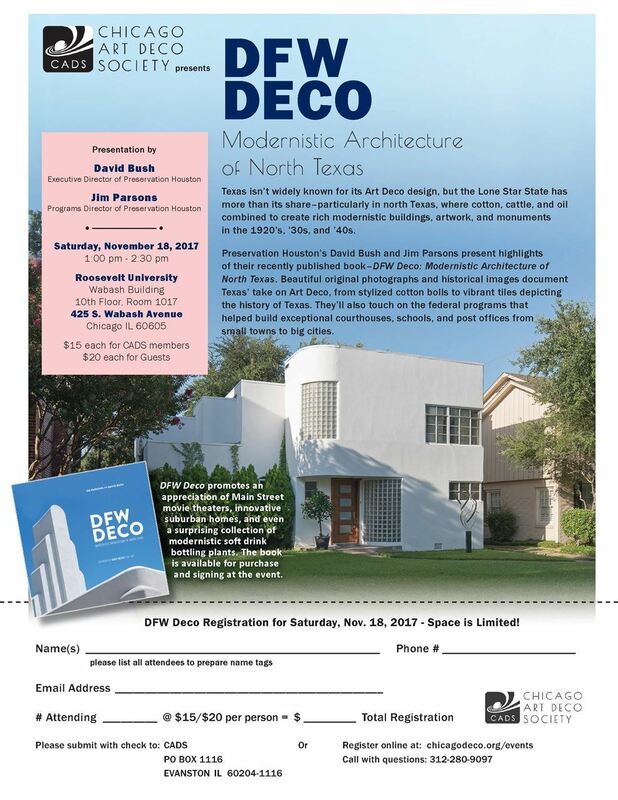 Preservation Houston’s David Bush and Jim Parsons present highlights of their recently published book–DFW Deco: Modernistic Architecture of North Texas. Beautiful original photographs and historical images document Texas’ take on Art Deco, from stylized cotton bolls to vibrant tiles depicting the history of Texas. They’ll also touch on the federal programs that helped build exceptional courthouses, schools, and post offices from small towns to big cities.